Every week I go to the market, list in hand, and game plan on my mind. I get everything I need, head home, put it away, and think to myself "this is going to be an AWESOME week." Then that little thing called life happens and before you know it we have eaten out three times and my refrigerator is full of produce that NEEDS to be used. Maybe this never happenes to you, but all to often this is the story of my life. I hate waste, but I can't use all of this stuff in a day...Or can I!?! The answer to that question is yes, you can! You can make this delicious Homemade Vegetable Soup that is PERFECT for warming your soul on a chilly autumn night and cleaning out that fridge! Just add a few staples from the pantry and you are good to go. It is so scrumptious and I can't wait to show you how to make it! Let's get started! 1 lb. Roma Tomatoes, large chop or 1 28 oz. Can of Peeled Tomatoes. Anytime you are making a dish that requires a lot of chopping, do it before the cooking even begins. Trust me! In the long run it is going to save you time and stress. Place your soup pot over a medium/high heat and add 2-3 tbsp. of extra virgin olive oil. Once the pan is hot, add the onion and garlic. Allow them to cook until the onions become soft and translucent. Whenever I am making a big pot of soup I like to season in layers. Next add the dry white wine to the pot. Place the lid on your pot and allow the vegetables to cook for 5 minutes. While the vegetables are cooking down a little, take this time to chop your tomatoes or open your can. Add the tomatoes to the pot. If you added canned tomatoes use the back of your spoon to break them up a little. Place the lid back on the pot and let those tomatoes cook down for 10 minutes. After the tomatoes have cooked down for 10 minutes add your vegetable stock. I had made some vegetable stock a while back and froze some in ice trays. I added a tray full of cubes and water. Of course, if you are not a vegetarian you can simply use chicken stock. Add the bay leaves and thyme to the pot. I tied the thyme sprigs together so they are easier to remove from the pot. Bring the soup to a boil and cover. The reason I am adding chickpeas is because they are an excellent source of protein in this dish! Cover and allow the soup to cook for 5 more minutes so that they can heat through. 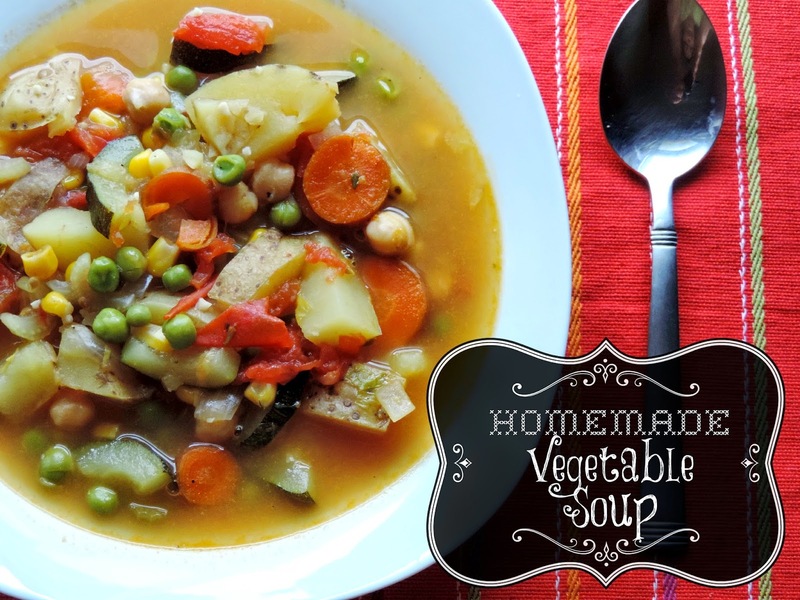 Look at this simply scrumptious Homemade Vegetable Soup! No one would ever guess that it was something you threw together out of necessity. It's warm, colorful, and so very good for you! Pardon me while I take a little bite. MMMMMMM......So head in to your kitchen tonight and make this AMAZING Homemade Vegetable Soup for your family! They are going to love it and so will you! Chop and prepare all of the vegetables. Place a soup pan over a medium/high heat and add the olive oil. Allow the pan to get hot. Add the onions and garlic to the pan. Cook until the onions start to become soft and translucent. Add the carrots, celery, zucchini, and potatoes to the pot. After the 5 minutes are up add the chopped tomatoes to the pot, cover, and let them cook for 10 minutes. Pour in the stock and add the bay leaves and thyme. Cover, bring to a simmer, and cook for 10 min. Now add the peas, corn, and chick peas to the soup. Cover and cook for 5 minutes. *You can omit the wine, just add a cup of water.